With a small population and rich oil reserves, Libya (pop. 6,020,000; GDP/cap US$5,734) enjoys one of the highest GDPs per capita in Africa. However the radical ideology (Third Universal Theory) espoused by the Government has discouraged foreign investment, not to mention the terrorist past of Colonel Qadhafi, which has damaged Libya's international image. Property ownership is a public interest. But according to Qadhafi's Green Book (Manifesto), private ownership is recognized as long as it is non-exploitative. In May 1978, a law was passed granting each citizen the right to own one house. More than that, property ownership is prohibited. Libya is normalizing relations with the West and is opening the country to large-scale foreign projects, but so far not to small-scale buyers. 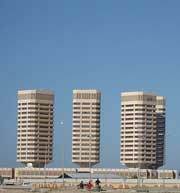 In August 2006, Libya issued Decree 21, establishing a new state-owned real estate company to partner foreign and private firms to invest in the real estate sector. Foreigners can now buy real property in the country, though it is not clear if land is included. Foreigners have been slow to take advantage of the changes because the laws are still unclear. Rental Income: Rental income is taxed at a flat rate of 20%. Capital Gains: Capital gains are treated as ordinary income and taxed at a flat rate of 20%. Inheritance: There are no inheritance taxes in Libya. Residents: Residents are taxed on their Libyan-sourced income. Different income tax rates apply depending on the source of income. Property transaction costs in Libya are around 3% to 3.50% of the property value. Registration duty is levied at 2%, and stamp duty is levied at 1% to 1.50%.